The Niagara Falls are on the Niagara River, straddling the international border between the Canadian province of Ontario and the U.S. state of New York. The falls are 17 miles (27 km) north-northwest of Buffalo, New York. . Frenchman Samuel de Champlain described the area in his journals in 1604 during his exploration of Canada, after members of his party reported to him the spectacular waterfalls. Niagara Falls is composed of two major sections separated by Goat Island: the Horseshoe Falls, which today is entirely on the Canadian side of the border, and the American Falls on the American side. The smaller Bridal Veil Falls are also located on the American side, separated from the main falls by Luna Island. The Falls were formed when glaciers receded at the end of the last ice age about 10,000 years ago, and water from the newly formed Great Lakes carved a path through the Niagara Escarpment en route to the Atlantic Ocean. While not exceptionally high, the Niagara Falls are very wide. It is the most powerful waterfall in North America. The Niagara Falls are renowned both for their beauty and as a valuable source of hydroelectric power. Niagara Falls is divided into the Horseshoe Falls and the American Falls. The Horseshoe Falls drop about 173 feet (53 m), and the height of the American Falls varies between 70–100 feet (21–30 m) because of the presence of giant boulders at its base. The larger Horseshoe Falls are about 2,600 feet (790 m) wide, while the American Falls are 1,060 feet (320 m) wide. 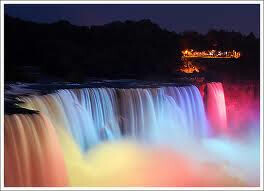 During the 18th century, the Falls became a popular tourist and honeymoon destination. Tourism became popular, and by mid-century, it was the area’s main industry. Napoleon Bonaparte’s brother Jerome visited with his bride in the early 19th century. In 1848, the falls actually went dry; no water fell for about 40 hours. Later that year demand for passage over the Niagara River led to the building of a footbridge was built. In 1941 the Niagara Falls Bridge Commission completed the third current crossing in the immediate area of Niagara Falls with the Rainbow Bridge, carrying both pedestrian and vehicular traffic between the two countries and Canadian and U.S. customs for each country. 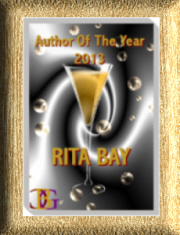 Tomorrow: A special guest, author Cara Lynn James will blog about High Society: The Golden Era. Great pictures. Given that erosion causes the edge of the falls to recede upstream affecting the total 3-D geometry of the Falls as it does; it would be great to have a decades long time lapse video of said geological process. With today’s technology making that possible for not too much money; I wonder if someone is doing that now. If you’ve never visited this place, it is something to see! Remarkable. Do yourself a favor and go to the Canadian side of the Falls. So clean, so European in feel. It’s a trip that I’ll never forget. We visited the falls with our children long ago. My oldest, who had to be about seven or eight, ask his Dad in all seriousness, “What time do they turn the falls off?” We never let him forget it, either.